After facing a scarcity of funds and a challenging law and order situation for about two decades, Indian Railways’ expansion in the Northeast is finally gaining momentum. Three of the five key railway projects identified by the Prime Minister’s Office (PMO) as “critical” for the region are nearing completion. Projects about to be completed include the first rail connectivity projects in Meghalaya and Arunachal Pradesh, along with crucial gauge conversion between Rangpara and North Lakhimpur, which would connect Arunachal Pradesh to the rest of the country. The three projects entail a cost of about Rs 3,000 crore. “Our deadlines for the first rail connectivity to Meghalaya and Arunachal Pradesh are set at March 2014, and we will achieve it this time,” said a Railway Board official. For India, the Northeast region bordering China is strategically important, but lack of funds and the adverse law and order situation there have kept the region infrastructure-starved. Officials in the Ministry of Development of North Eastern Region, however, said development of the Northeast had found a special mention in the 11th and 12th five-year Plans. “This has helped fast-track projects in the region,” the officials said. Dudhnoi-Mendipathar, a 20-km line in the Garo Hills of Meghalaya, involving an investment of about Rs 180 crore, has been in works for about two decades. Announced in Budget 1992-93, the line faced several hurdles. “There was a severe law-and-order problem. Railway officials had been kidnapped in the past. Locals resisted, fearing with rail connectivity, illegal immigrants would settle here. 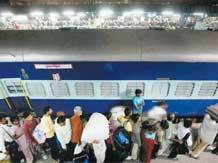 Things have improved, but we have to be careful,” said a senior North East Frontier Railway official. Officials said on the ground, work was underway in full swing. Land acquisition for the line was complete and three major bridges on the line had also been completed, along with 50 minor bridges needed on the hilly terrain. “It’s a tough terrain we are working on,” said an official involved with the project. Harmati-Naharlagun, a 20-km line in Arunachal Pradesh announced in 1996-97, would cost the railways about Rs 407 crore. The line is set to record its first run in March 2014. The line was identified as crucial to national security in the last Railway Budget, owing to the presence of Chinese railway infrastructure on the state’s borders. “China is investing heavily in domestic and trans-ASEAN (Association of Southeast Asian nations) network and India has failed to catch up. The importance of connectivity in the Northeast is self-evident; it’s our link to the ASEAN. The post-1962 war psychosis — if we build roads into the Northeast, it might be a potential security threat — is one that has to go away,” says C Uday Bhaskar, fellow at the Society for Policy Studies, a Delhi-based think tank. “There are some high power lines crossing the railway alignment; we have asked the Power Grid Corporation to realign these soon,” said a senior North East Frontier Railway official. He added this time, the railways would complete the work on time. In 2007, conversion of the 510-km Rangiya-Murkongselek line from metre gauge to broad gauge was declared a national project. Scheduled to be completed in three phases, a 123-km stretch is already ready. The PMO had said the second phase, the 172-km Rangpara-North Lakhimpur stretch, would be completed on a priority basis. Now, tracks have been linked and the station and yard works are underway. The project was announced in 2003-04; since then, it has faced various hurdles such as lack of funds. Railway officials say there is a dearth of good contractors in the region. Frequent strikes also affect work, they add. In July this year, the Ministry of Finance had agreed to provide an additional Rs 400 crore for these three projects. 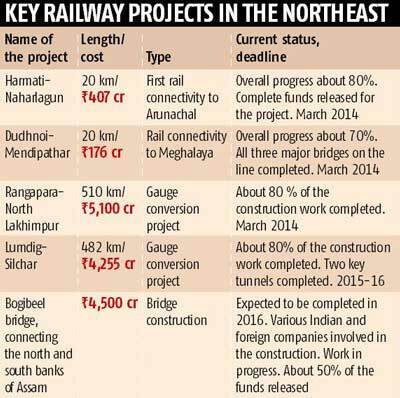 North East Frontier Railway officials say the perpetual lack of funds has stalled about 10 projects in the region. These projects, ranging from construction of new lines to gauge conversion, involve an investment of about Rs 20,000 crore. “This year, we got about Rs 2,400 crore from the Ministry of Railways, but the demand is about Rs 4,500 crore a year. We have the capacity to increase the speed of the projects and expedite completion,” said a senior railway official. The Bogibeel bridge connecting the north and south Bank in Arunachal Pradesh and costing about Rs 4,500 crore, is expected to be completed by 2016. However, officials say the completion “depends on the availability of funds”. Completion of the Lumding-Silchar gauge conversion announced in 1996 might also have to wait.